Macrocrystalline - crystals visible to the naked eye. This branch of the quartz family includes amethyst, citrine, rose quartz, smoky quartz and rutilated quartz. Micro- or cryptocrystalline - crystals too small to be seen without magnification. This branch of the quartz family is more commonly known as chalcedony (kal-SEH-doh-nee) and includes agate, jasper, carnelian, chrysoprase, aventurine, onyx and petrified wood. Quartz is cool to the touch and Roman ladies carried quartz balls to cool their hands in the summer. For many centuries, quartz passed for diamonds. Crystal balls made of quartz are used to predict the future. In general, quartz is said to be a universal healing stone. It is also believed to promote hope, happiness and optimism. Lemon Quartz is the yellow form of quartz. It is known for being a paler, truer yellow than citrine (also a variety of quartz). 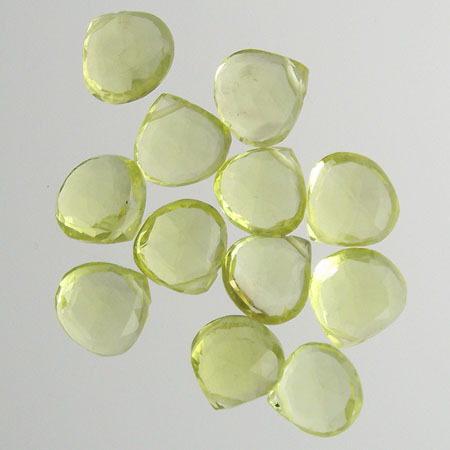 Most lemon quartz on the market is heated or irradiated to produce its sunny yellow color. Clarity of communication is often associated with lemon quartz. It is believed to help focus thoughts, leading to balance and happiness. Want to perform well during a job interview or when taking a test? Wear a lemon quartz necklace or bracelet. Care: Lemon quartz is fairly hard so it can be cleaned with a steamer or ultra-sonic cleaner. However, I prefer to use soapy water and a soft, clean toothbrush. Rose quartz is one of the most desirable of the macrocrystalline quartzes. Its soft pink to rose color adds a feminine touch to jewelry designs. Most rose quartz on the market is dyed to maintain a uniform color. 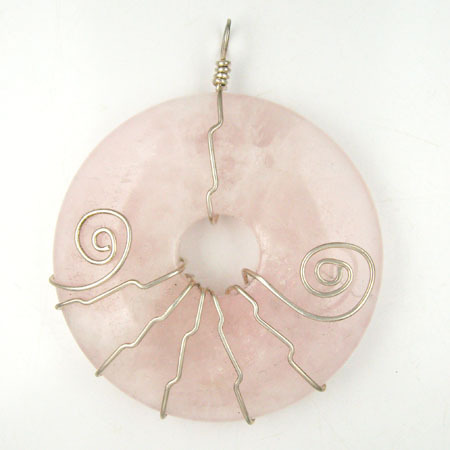 Rose quartz is sensitive to sunlight and may fade if exposed for long periods of time. Rose Quartz is often called the "love stone" because it is thought to generate strong love energies and to help find new love. Care: Rose quartz is fairly hard so it can be cleaned with a steamer or ultra-sonic cleaner. However, I prefer to use soapy water and a soft, clean toothbrush. ​Rock crystal quartz is the clear variety of macrocrystalline quartz. It is considered the ideal of macrocrystalline quartz. It was first found in the Alps and people believed it was a form of ice that would never melt. It is said to have cooling properties which are apparent as soon as you hold it. Since the Middle Ages crystal quartz has been formed into balls which are used to predict the future. 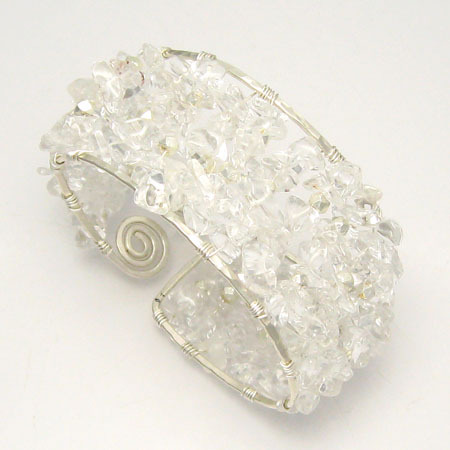 Rock crystal quartz is believed to draw off negativity. It is thought to enhance concentration and unlock memories. 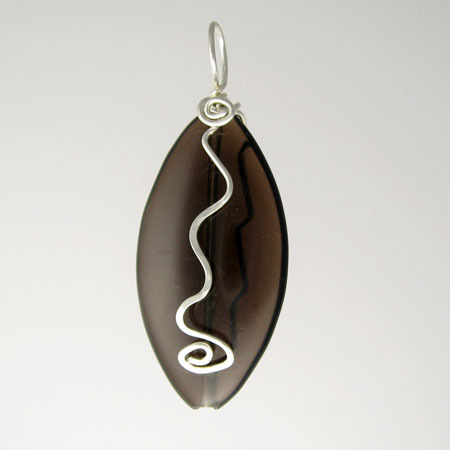 Smoky quartz is named for its smoky brownish black color. Most smoky quartz on the market is actually rock crystal quartz that has been heat-treated to produce its smoky color. It's difficult to find natural smoky quartz. Smoky quartz is said to help you reach your personal and business goals and to be a superb antidote to stress.